Industrial-scale laundries are committed to minimizing their use of natural gas, electricity and other fuel sources to heat water, produce steam, fire burners and otherwise operate their equipment. To ensure maximum efficiency of these functions, they invest in the largest-capacity machinery possible (to generate economies) with the latest energy-saving features. They take an additional step by recovering heat from boiler stacks and wastewater discharges. They emphasize maintenance to keep equipment running smoothly and efficiently. Plus they deploy energy-conserving practices as any business would, including low-power lighting and state-of-the-art heating and air conditioning controls. LaundryESP® determined that total in-plant energy used per pound of textiles laundered declined relatively consistently from 1997 through 2009. 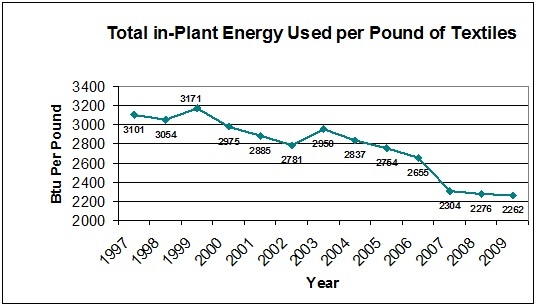 The overall drop was 27% over these 13 years, from 3,101 Btu per pound to 2,262. Natural gas accounts for by far the greatest share of total in-plant energy used by the industry. If the industry’s energy intensity had remained at its 1997 level, its total energy use in 2009 would have been 40.3 trillion Btus rather than 29.4 trillion Btus. Thus the energy efficiency gain saved 10.9 trillion Btus in 2009. This is the equivalent of the annual residential energy consumption for about 115,000 typical U.S. households (for space heating, water heating, and appliances).